You can rely on the quality of Tuttorosso Tomatoes to transform your creativity into the perfect meal. Our tomatoes are picked at the peak of ripeness using Non-GMO Project Verified ingredients and packed in Non-BPA lined cans. When you don't have to worry about what's in the can, you are free to be inspired! Who says Tuesdays is for Tacos? Make Chicken Enchiladas with Tomato Salsa & Cilantro Cream for the perfect at-home Mexican meal! With Latin markets in most cities now, there are a lot of hispanic convenience foods readily available when cooking a Mexican dish. But making an enchilada sauce isn't hard, and you don't get the extra preservatives that you would in a store-bought jar. And, you can make the sauce ahead and store in fridge or freeze for when you are ready! 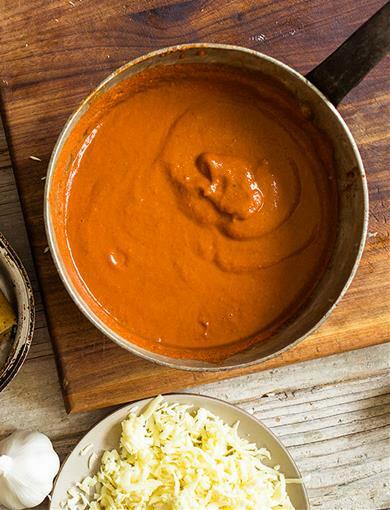 Our #1 selling crushed tomatoes are slowly simmered for a smooth bright taste; and make the perfect base for this sauce. Our chicken enchiladas are stuffed with a juicy, cilantro-seasoned chicken. 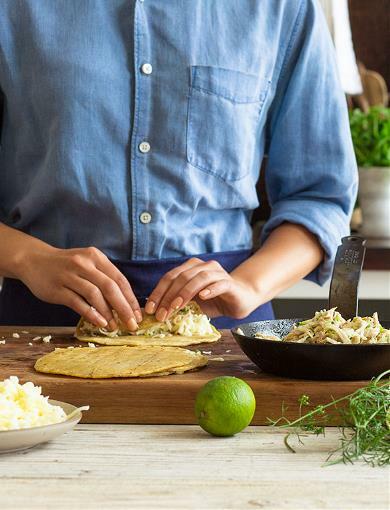 Onions, garlic, cilantro and green onions cook together to season the chicken for the perfect filling. 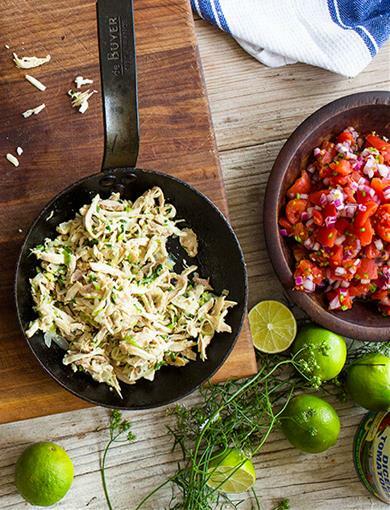 We love to have cooked chicken on hand that we can quickly shred for whatever we're making. Have you tried shredding chicken in your stand mixer - game changer! Tortillas are warmed in a skillet to make for easy rolling. 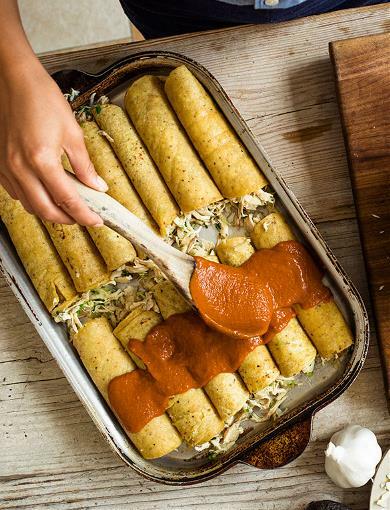 You can dip them in enchilada sauce if you choose, we prefer easy clean up by filling a naked tortilla with chicken, top with cheese and roll up, and then place seam-side down in a baking dish. 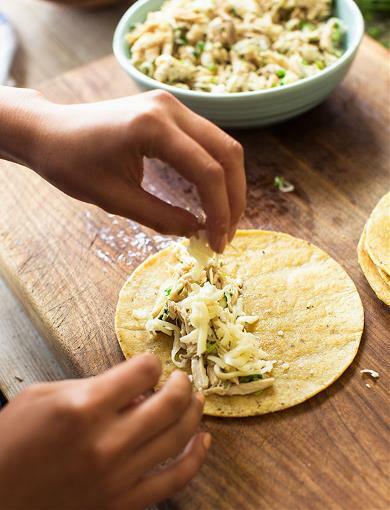 Keep stuffing and rolling, using all of the tortillas. They should all fit in a greased 9x13 baking dish. Once you have all of them rolled and in the baking dish, cover with that savory enchilada sauce. Making sure each one gets a good slathering! If you have any sauce leftover (yeah, we didn't think so) you can freeze it for up to 3 months. Then top with remaining cheese. Place in a pre-heated oven for 30 minutes until nice and hot! 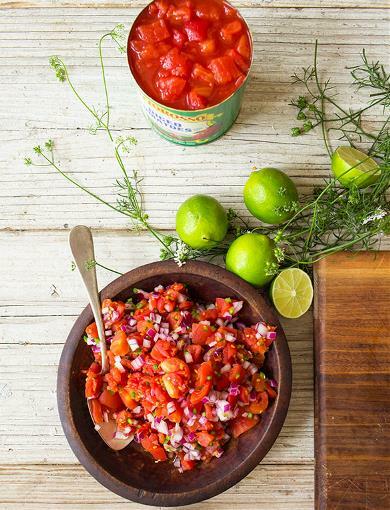 While the enchiladas are baking you can prepare the tomato salsa with our juicy diced tomatoes. These bite-sized tomatoes are what tomatoes are supposed to taste like...red, vine-ripened summer tomatoes. You can't always get your hands on a fresh, ripe tomato, but you can always get a can of our delicious diced tomatoes any time of the year! And did we mention Cilantro Cream? 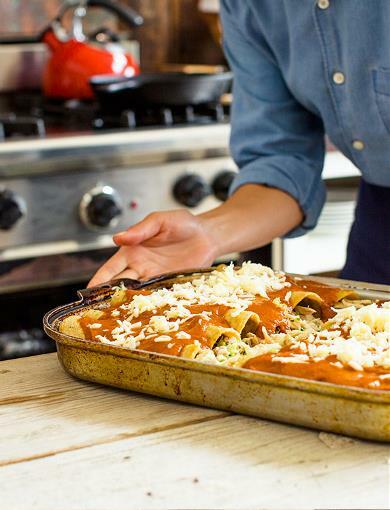 Cool and creamy makes the perfect topper for these enchiladas! You can make this and the salsa a couple of days ahead and store in your fridge. 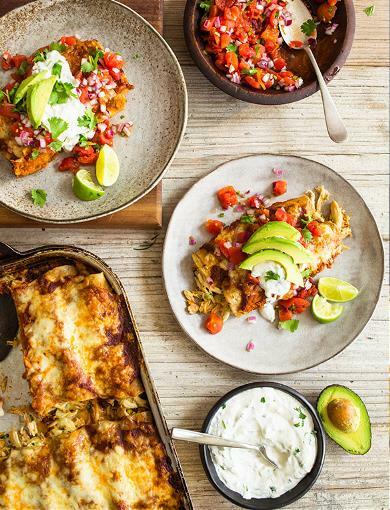 Place three enchiladas on a plate and top with Tomato Salsa, Cilantro Cream, fresh cilantro, avocado and lime wedges for the perfect enchiladas! Mexican at home...just add chips and a margarita for the full experience! There are no limits on what you can create! You can be assured your recipes will be their best when you use the very best quality ingredients including Tuttorosso tomatoes!